New Delhi, April 4: Apple, in association with the HDFC Bank, has slashed the price of its flagship smartphone iPhone XR in India for a limited period that will be applicable from Friday. The till-the-stock-last offer brings down the price of Rs 76,900 iPhone XR (64GB) to Rs 59,900 for non-HDFC customers and Rs 53,900 (64GB variant) with special cash-back offer for HDFC customers, the company said on Thursday. "This is not a price drop or change on MRP but a limited term promotional offer which starts Friday," it added. Apple iPhone 11 New Render Image Leaked Online; To Feature Dual Pop-Up Selfie Camera. 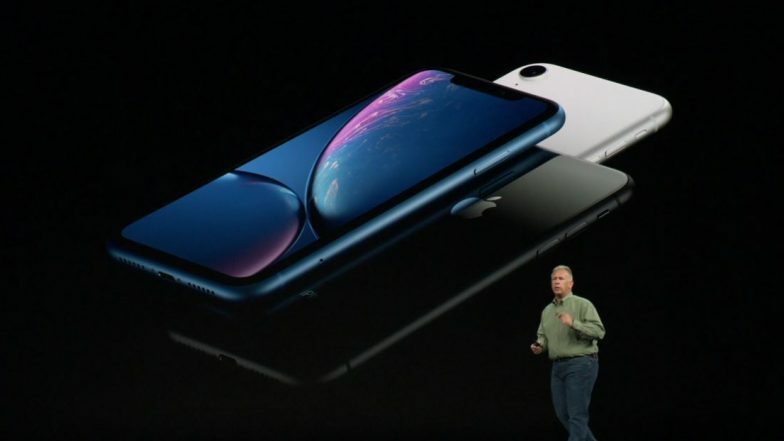 With all-screen glass and an aluminium design featuring 6.1-inch display which is touted as "the most advanced LCD in a smartphone," the iPhone XR houses A12 Bionic chip with next-generation "Neural Engine", which unlocks new experiences for immersive augmented reality (AR), games and photography. Apple Starts iPhone 7 Production in India at Wistron Plant in Bengaluru. The device has 12MP rear camera and 7MP front camera. The iPhone XR is water resistant, with a rating of IP67, and protects against everyday spills including coffee, tea and soda.